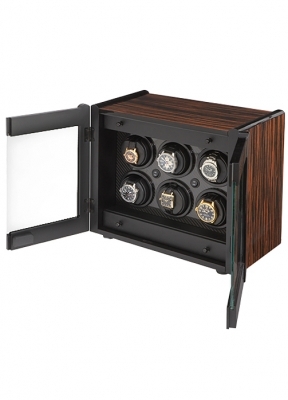 The Avanti 6 is designed to wind six watches and has two storage drawers. Each winder level has its own power switch but individual stations can also be turned off when not in use. Combining exotic Macassar veneer and genuine carbon fiber trim results in an impressive cabinet that will retain a great look forever. Each user-programmable winder allows for head direction and turns per day (TPD) to be optimized for the watch being wound. Power is provided by the supplied AC/DC adapter.